It is interesting to note how radio stations employ various communication media to engage listeners in a dialog rather than a one-way broadcaster-to-listener monolog. As a listener, I have attempted to rank the current communication media employed by the stations on four parameters. There could be additional parameters (or even additional communication media), which I might have missed in this post. I’ll be glad if you can point out those. It is important to define ‘dialog’. I’ll stick to the definition contextual to the terrestrial radio broadcast: “Call for action solicited from the listener on a linear timeline synchronous with the terrestrial broadcast of the radio station”. This essentially means listener interaction sought on-air either by the Radio Jockey (RJ) or through an interactive advertisement with a definite start and end time during the segment/program broadcast. For example, “Guess the Property Price”, a contesting segment. This does not include off-air interaction such as listener comments on the social media or web presence of the radio station. Cost: Amongst the four listed communication media, short code bears the maximum charge to the listener as it is usually a premium priced SMS. Cost of other three depends on the voice/data tariff plan listeners have with their communication service provider. Immediacy: Ability provided by the communication medium to get across the listener’s response against a call for action in the least number of attempts with minimum effort. My personal experience as a listener is reaching the radio station over a phone call is the most difficult. Recall: Ability of the listener to remember the number to call/message the radio station. Acknowledgement: The response text (Push SMS) received by the listener against the SMS sent to a short code. For example, ‘Thanks for texting your favorite radio station. Keep tuned in for great music’. As I write this paragraph, the above text seems obvious and elementary, for the simple reason that terrestrial radio is the only broadcast medium that is still analog. Progressing on its target to a complete switch over to digital mode by year 2017, on September 24, 2013, the state broadcaster, All India Radio issued a tender to acquire 800 Digital Radio Mondiale (DRM) (a digital radio standard) General Purpose Receivers. 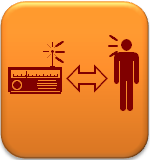 Will digital radio change the mode and manner of dialog between the radio station and its listeners?